Don’t sell your basement short it is full of possibilities as valuable living space. Remodeling a basement is not a DIY job. There are many obstacles that come up and have to be dealt with properly. Basements usually have ductwork and elements such as a furnace, water heater and softener. Many Plymouth area homes have a sump pump to deal with water problems during heavy a rainfall. The team at Bannochie Builders, Inc. has the skills and experience to take care of wet basements, HVAC obstacles, insufficient lighting and adding proper insulation. The work our team has completed with entire home renovations and basements in particular has made us Expert Basement Remodeling and Finishing Professionals. We will evaluate the foundation and take care of Waterproofing. Adequate insulation can be added to create a warm and cozy atmosphere. Larger windows can be installed to bring in more natural light. The space can be configured into a very functional layout. 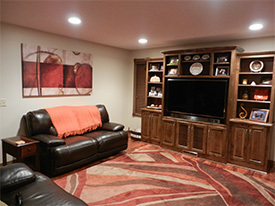 Flooring, Lighting, Drywall and Paint transform an underused basement into a warm and inviting living space. A Fireplace warms up the space and adds comfort on cold winter nights. Adding a Bar or Kitchenette elevates the room into a great place to entertain. Bannochie Builders, Inc. can transform your unfinished basement into a fully functional and comfortable living space. A top quality finished basement adds valuable square footage to a home. We are Licensed Remodeling Contractors with many years of experience with helping Plymouth, MN homeowners to discover the potential hidden in their basements. Our team is experts when it comes to finding solutions to overcome basement remodeling obstacles. This entry was posted	on Wednesday, April 1st, 2015 at 9:38 pm	and is filed under Family Room Remodeling. You can follow any responses to this entry through the RSS 2.0 feed. You can leave a response, or trackback from your own site.